Nov. 26, 2013, 11:09 a.m.
For its actions around the former domain name of the Online Journalism Review, the Australian company Oneflare has felt some SEO pain. By Joshua Benton @jbenton Nov. 26, 2013, 11:09 a.m. 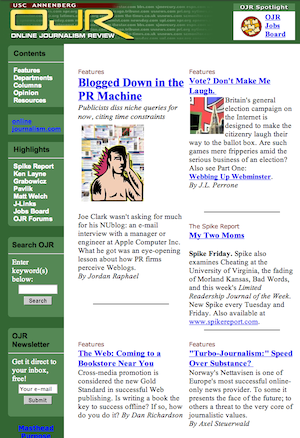 I hope you’ve been following the saga of OJR.org, the former home of the Online Journalism Review. In brief: When USC allowed the domain name to expire, an Australian company named Oneflare snagged the domain name and proceeded to create a fake version of the “Online Journalism Review” — adding USC and USC Annenberg logos to make it seem legit, stealing dozens or hundreds of archival OJR stories to give it heft, and generally being scummy enough to act as if it was still the legendary site that’s been around since the late 1990s. After my first story, Oneflare did its best to take down the legally actionable parts of its scheme — removing the logos, deleting the archives — but still carried on as the “Online Journal Review,” featuring links back to the main Oneflare website. This is a common if scuzzy search engine optimization strategy: Use sites with high PageRank sites (those Google considers highly legit) to generate links to your company’s website, passing some of the Google juice earned over 15 years of publishing to the new venture. After my second story, Oneflare removed all the content from OJR.org; it’s currently a blank site. Thanks to a little birdie, we know now that there have been consequences for Oneflare’s actions. My website received a sitewide manual action for unnatural inbound links back in July. We were able to get this revoked in August by removing about 50% of the links and disavowing the rest. I think this blog triggered our domain for another manual review and we were hit again with another sitewide manual action. I was surprised because other than buying that expired domain, we hadn’t done any other spammy link building since the last manual action was revoked. However after looking into webmaster tools and going to recent links I noticed that there were tons of spammy links that were built 3-6 months ago that were recently being indexed by Google. My question is, does the the new indexation of the bad links that were built ages ago still get counted when Google is considering whether or not to take manual action? Obviously we’ve taken down the new blog that was built but what else can we do to get the second manual action revoked? While Google relies on algorithms to evaluate and constantly improve search quality, we’re also willing to take manual action on sites that use spammy techniques, such as demoting them or even removing them from our search results altogether. @JohnMu @mattcutts We got a 2nd manual action, yes, some new bad links but mainly there's problems with old links being indexed. Any advice? Feel free to name the Expert who suggested this amazing strategy so we can all point and laugh and try to protect other honest businesses from their flimflam. abc.com has a ton of crappy links and obviously I do not want to 301 or 302 this to abc.co.uk as i do NOT want the link juice or pagerank to pass. No idea if this is the plan, but Dong also owns oneflare.net. One of my favorite stories from the earlier days of the web is the tale of nigritude ultramarine. Every so often, SEO types hold a contest to see who can build up the most SEO juice around a particular phrase in a given period of time — to see who can earn the top search result when someone looks up those words. It’s best if that phrase doesn’t already exist anywhere on the web, so a nonsense phrase like nigritude ultramarine works well. In 2004, that magic phrase was announced, and everyone had a couple of months to start gaming search engines. Lots of competitors tried lots of tricks. A search for “nigritude ultramarine” returned zero results before the contest; it returned more than 200,000 afterward. But, in the end, the winner wasn’t an SEO consultant; it was Anil Dash, the popular blogger, who wrote a single post with that phrase as its title and simply asked his fans to link to it. “I’d rather see a real blog win than any of the fake sites that show up on that search result right now,” he wrote. While SEO types were polluting the web with links, Dash took the prize with a single post — because he’d built up credibility through writing good content for years, and because he had actual human readers who were willing to support his efforts. I always thought of that win as a triumph for real humanity on the web. What’s the best way to get ranked high in Google? Write good content. Be good enough that real humans like you. POSTED Nov. 26, 2013, 11:09 a.m.
Benton, Joshua. "OJR.org: Google’s punishment and the perils of blackhat SEO." Nieman Journalism Lab. Nieman Foundation for Journalism at Harvard, 26 Nov. 2013. Web. 19 Apr. 2019. Benton, Joshua. 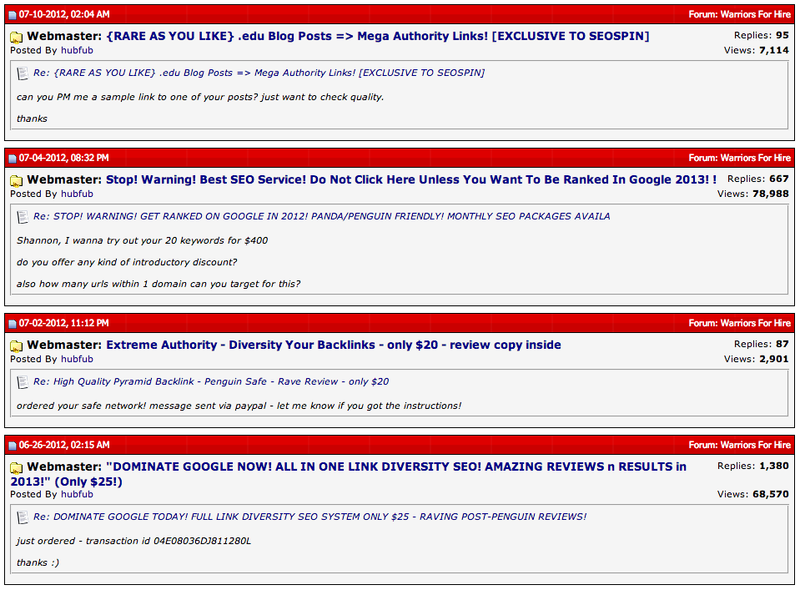 "OJR.org: Google’s punishment and the perils of blackhat SEO." Nieman Journalism Lab. Last modified November 26, 2013. Accessed April 19, 2019. https://www.niemanlab.org/2013/11/ojr-org-googles-punishment-and-the-perils-of-blackhat-seo/.